If you've ever ventured around the streets of Tokyo, you've probably seen these delicious fish-shaped pastries. Generally, Taiyaki is a waffle-like pastry filled with a tasty sweet filling like red bean or ice cream. These delectable treats are vastly popular all over Japan. Now, you can make these yummy treats at home! We did the research for you and reviewed the best taiyaki makers on the market just for you! Taiyaki's literal translation is "grilled sea-bream", which is a popular style of fish. However, don't let the name fool you on flavor. This delicious street food classic is actually a waffle-like batter shaped like a fish and filled with an assortment of sweet fillings. Although the fish shape is not certain, some say that sea bream was very expensive in the past. So, vendors used to shape the pastries like fish to make it seem more luxurious. Regardless of social status, these cakes are incredibly irresistible and loved by many. First, sift ½ cup of cake flour and 2 teaspoons of baking powder and set aside. Usually to achieve light texture, cake flour is used for taiyaki 붕어빵 and 호두과자 walnut cake. Then in a mixing bowl, crack in an egg and add in 3 tablespoons of granulated sugar and ¾ cup of milk. Whisk until combined. Then pour in flour mixture into wet mixture and fold until homogeneously mixed. And brush the molds with vegetable oil, brush all four molds. And fill the mold only half full with batter. Then spoon in the 1 tablespoon of sweet red bean paste. I am using cooked sweetened whole red bean paste for patbingsoo. And pour the batter in the mold until it’s full. Close the pan and turn it over. Cook for 30 seconds. Repeat until cooked. It normally takes for 3 to 4 minutes over low heat. Want the perfect solution to making taiyaki at home? This incredible electric taiyaki maker by Macross is the perfect product for you. Not only can you make these tasty morsels in you own kitchen, but also you can do it without a stove! Coming in at about W 23.5 × D 24.5 × H 9.5 cm and 1.3kg in weight, the electric taiyaki maker is easy to use with set temperatures at 230 degrees C. Also, the surface is non-stick, making it easy to remove the pastries once they're cooked. In the end, this is by far one of the best taiyaki makers on the market. For those of you who are just getting your feet wet with Japanese street food cooking, this is your best bet! 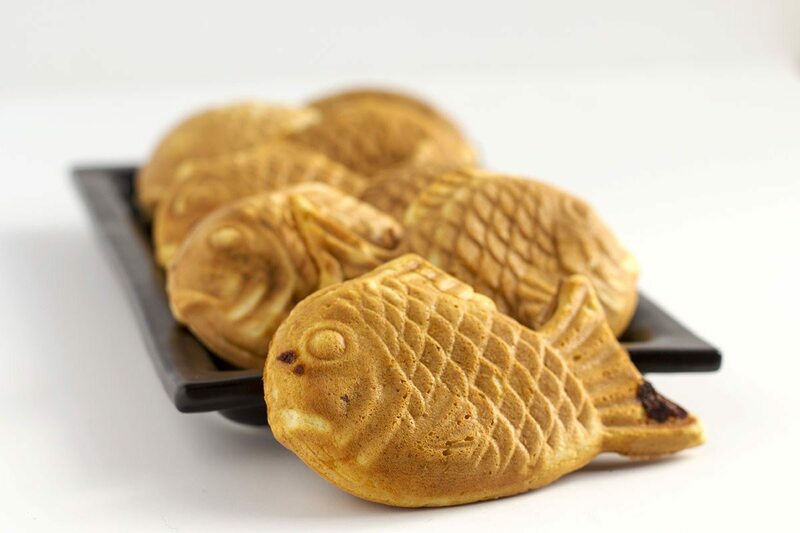 If you're looking for a fun way to make delicious taiyaki at home, this is the product for your. This incredible electric taiyaki maker by D-STYLIST does it all without having to buy extra parts. Coming in at about W 23 × D 24.5 × H 9 cm and 1.3kg in weight, the electric taiyaki maker is easy to use. The plates are made from lightweight Aluminum with Fluororesin processing. Also, the taiyaki mould is easy to clean. Temperatures reach up to 230 degrees C, perfect for cooking taiyaki. Overall, you will absolutely LOVE what this electric taiyaki maker can do for you in the comfort of your own home. We highly recommend this product for beginner taiyaki makers.